I share this story from a facebook post. This event happened over three years ago, yet it stirred my spirit and brought me a moment of joy. I hope it does the same for you. A front page story in the San Francisco Chronicle told the story of a female humpback whale who had become entangled in a spider web of crab traps and lines. She was weighted down by hundreds of pounds of traps that caused her to struggle to stay afloat. The whale also had hundreds of yards of line rope wrapped around her body, her tail, her torso, a line tugging in her mouth. A fisherman spotted the whale just east of the Farallon Islands (beyond the Golden Gate bridge) and radioed an environmental group for help. Within a few hours, the rescue team arrived. They determined that the whale was so bad off that the only way to save her was to dive in and untangle her. The team worked for hours, carefully slashing through the labyrinth of lines with curved knives. Eventually, they freed her. 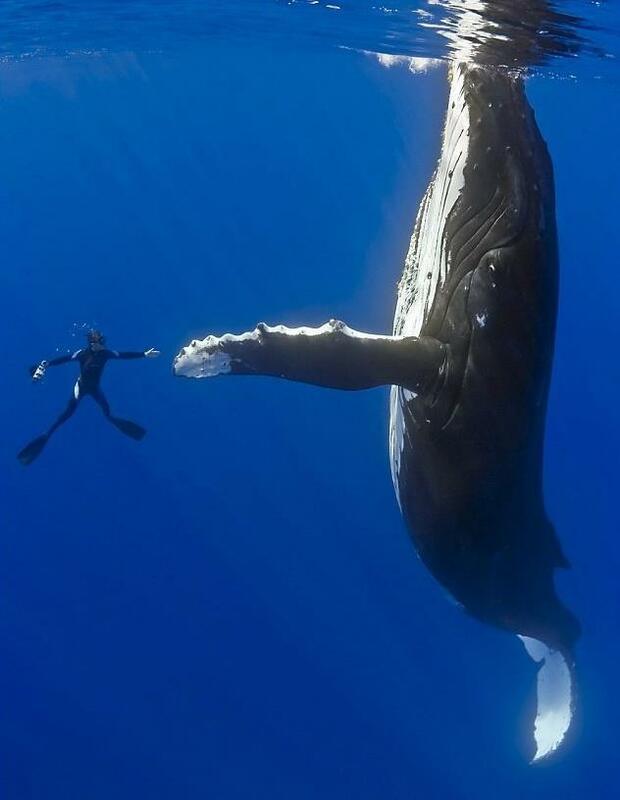 The divers say that once the female humpback was free to move, she swam in what seemed like joyous circles. The whale then came back to each diver, one at a time, and gave each a nudge, pushing her rescuers gently around as she was thanking them. Some divers said it was the most beautiful experience of their lives. The diver who cut the rope out of the whale’s mouth said her eyes were following him the whole time. And he will never be the same.